hand, is in all respects a more complete and coherent piece of " carcase work/1 and is characterised throughout by a greater degree of homogeneity. On examining the accompanying types it will be remarked that the former, with exceptions so rare as to be practically non-existent, is always quite open at the lower part (see Fig. 4, Plate II., and Fig. 4, Plate III., "Elizabethan"). 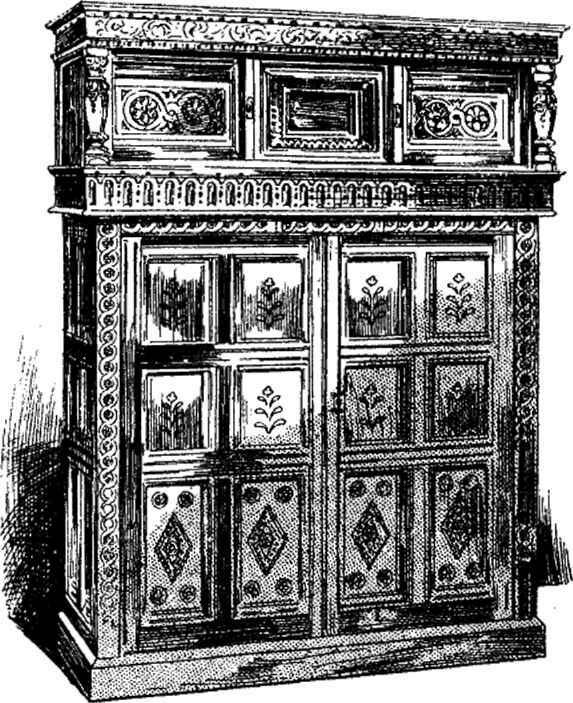 It is supported in the same manner as were the tables of the period, by sturdy turned legs, more or less decorated; while the lower part of the " Bread-and-Cheese" cupboard is invariably closed in— is, indeed, actually a cupboard—almost to the floor, from which it is raised, generally some six or nine inches, by spheres (see Fig. 5, Plate III. ), "cushions" (see Fig. 4, Plate II. ), or sometimes simple blocks, of wood, or else by extensions of the end framing (see Fig. 2, Plate III., "Elizabethan"). This last arrangement was more generally adopted in cupboards of the cheaper class. and which is new. But "the public will have carving," says the dealer ; so " the vandal gouge of the wood-butcher " is set in operation, and old pieces, whose beauty rested in their very plainness and simplicity, are hacked about so far as considerations of price will allow, and when finished are regarded as "a lot for the money." So, indeed, they are; a very bad lot! 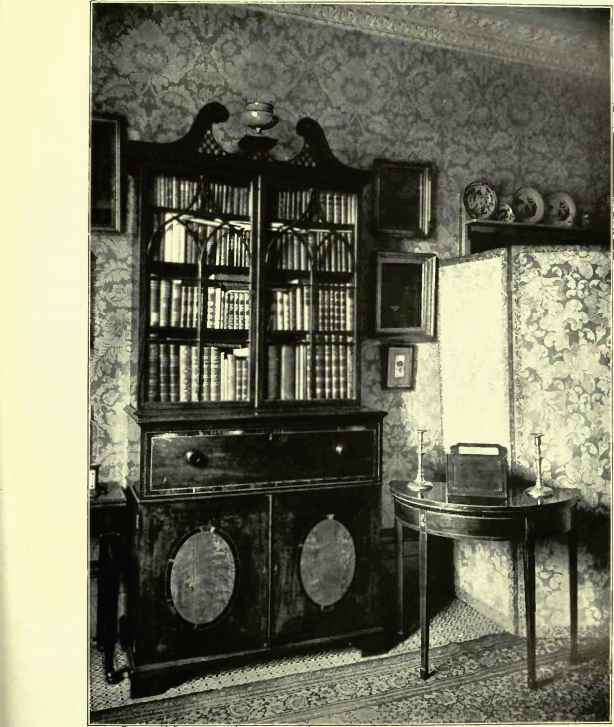 We have discussed " JacobeanM ornamentation at such length that little remains to be said with regard to the decorative detail of these old cupboards ; the carving in all of them illustrates the remarks I have already made, and which, 1 think. 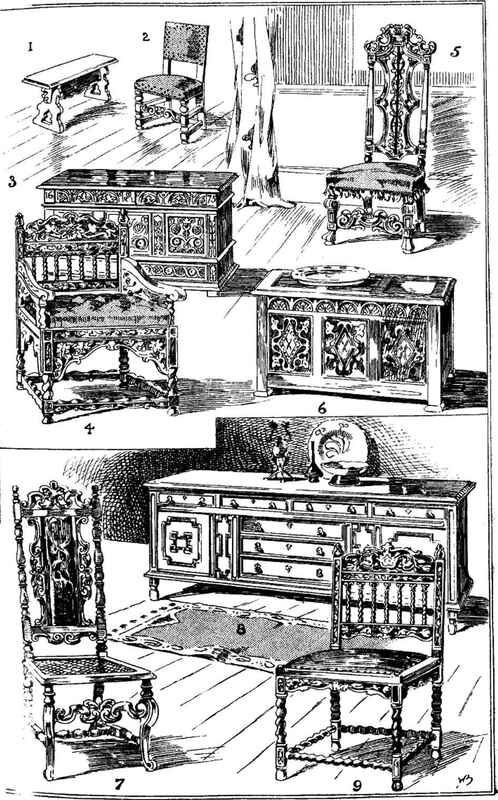 were exhaustive, with reference to that element in furniture of the Stuart age.